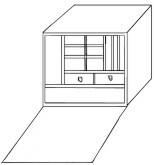 Lap Desks, Field Desks, Writing Items and Etc. 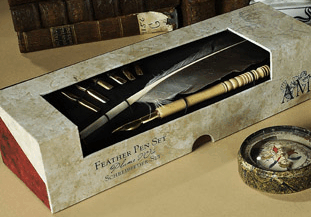 The writing sets, pencils, pens, ink, historical desks and desk accessories items listed below can be used by reenactors for living history or by museums and other institutions for history displays and other educational purposes. They are all fully functional. 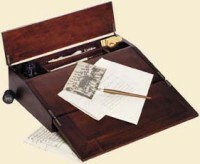 In the 19th century, British deck officers kept the daily log and traveling civilians wrote letters on lap desks like these. The originals were commissioned from renowned designers like Chippendale, Hepplewhite and Sheraton. 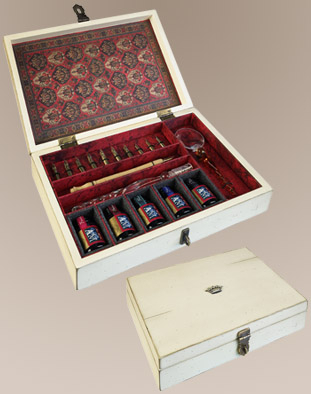 This replicas, as practical as it is stylish, would delight even the most discerning gentleman. This hand-made solid plantation mahogany desk has bronze hardware, two small secret compartments, space for inkwells, styluses and lots of paper. 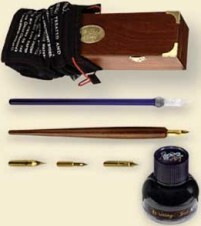 It comes with a bottle of black/India ink, 2 wood stylus and nibs. l 16" x w 10" x h 4". Not guaranteed to be 100% authentic for any specific period, but a good item for general 19th Century (1800s) impressions. Pictures of other reproduction and original Lap desks, NOT FOR SALE. We are hoping to have more lap desks available for purchase by Fall 2017. Not documented as to periods for use. 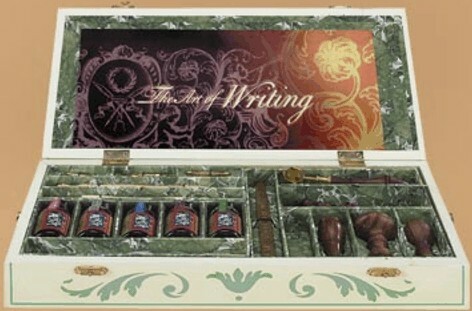 Traveler's Writing Chest: Beautiful cherry veneered box contains a wood stylus, 3 nibs, a glass stylus and a bottle of ink. 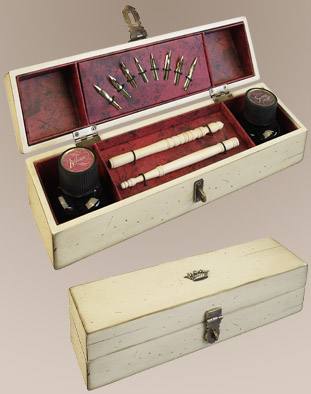 Acanthus Writing Box: Writing essentials including 2 bottles of ink, 2 wood stylus and nibs are held within an ivory writing box, soft and feminine, adorned with acanthus leaves. Support her love of the written word. 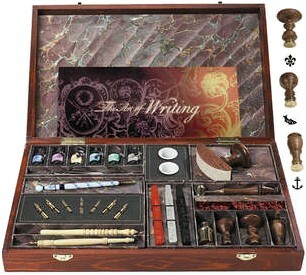 Acanthus Writing Box, Large: Sophisticated, classic writing tools beautifully arranged in marble paper lined compartments. Seal wax paraphernalia and wax itself, all included to finish a creation in just the right measure of taste. 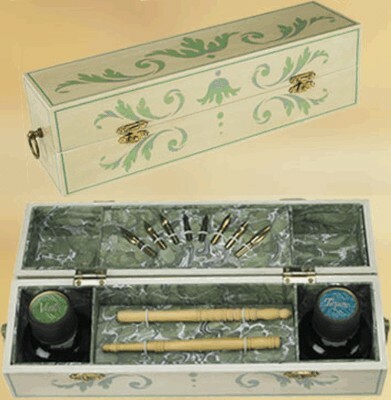 All that in a wonderful hand painted and stenciled wood box, complete with brass hardware. The Ship Chandler's Box is filled with all the paraphernalia to write an impressive document, which in the end needs to be sealed and stamped in was. Brass melting spoon, three beautifully turned wood and brass seals, a miniature travel burner to melt the wax, red and silver sealing wax in pellets and bars. Glass and wood stylus, generous supply of various brass nibs and six assorted inks, in wonderful colors: Turquoise, Bordeaux, Sienna, Verde, Auburn and Indigo. All this in a handsome brass-bound wood box with lid and latches. Enjoy the power of the written word. Oxford Writing Box: Beautiful cherry veneered box. 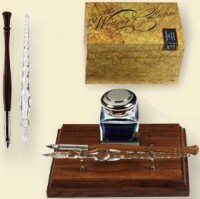 Contents include: marble paper blotter and two classic 1930s style celluloid fountain pens, two porcelain inkwells, ribbon-tied note cards with matching envelopes. Scribe's Treasure Writing Box: Beautiful cherry veneered box. 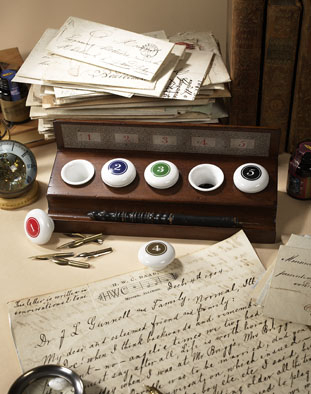 Contents include: Six (6) Mini Ink Bottles, Two (2) Porcelain Ink Cups, One (1) Glass Stylus, One (1) Porcelain Deft Stylus, Two (2) Wood Styluses, Nine (9) Brass Nibs, Blotter with extra blotter paper, Three (3) Rose Handled Brass Seals (1 anchor, 1 fish and 1 fleur-de-lys), Three (3) Wax Bars, Burner, Wax Shavings and Melting Spoon. Information coming soon. Not documented as to periods for use.